Winter is virtually here and, while many riders are dialing back road time or putting their steeds into hibernation as the snow begins to fall, BMW has announced two new bikes to dream about on those cold, dark nights. The first is the “all new” version of the boxer sport-tourer icon, the R 1200 RT, which includes the most recent upgrade of the venerable flat-twin engine. The big RT has been in BMW’s lineup for decades but 2014 marks the first year the new targeted-liquid cooled engine (BMW calls it “air/liquid cooled”) propels the RT. Wherever its exceeding the posted limit, rider and passenger on the big RT will do so in comfort, thanks to its generous seating, spacious panniers and a big, wind-tunnel sculpted fairing. The re-skinned RT is stuffed with tech, including electronic suspension adjustment, Rain and Road power modes, adjustable traction control, ABS, an option for clutch-less shifting, a tiltable color 5.7-inch TFT LCD multi-display, powered windscreen adjustment, cruise control and much more. There’s even a new hill-start assist system for those with a nervous clutch hand. Nearly all the tech options can be executed using an innovative left-grip controller that keeps the rider’s eyes on the road. BMW recognizes that today’s riders are tech-savvy, so the onboard computer can sync up with Bluetooth-enabled helmets and the grip controller can dial up a phone call or Ride of the Valkyries on your smartphone. Feel free to debate the safety of these features in the comments. Of course, BMW’s capable (and $900) Navigator V GPS unit plugs right into the RT and is controllable from the left grip. Oh, and the speakers in the fairing now have better bass response as well, so you can rock out while racking up the miles. The RT may represent an offering for BMW’s traditionally “mature” market (aka: older riders), but the new S1000R naked bike is solidly pointed at riders who aren’t yet listening to ED ads. Built around a re-tuned powerplant from the hyperspeed S 1000 RR sportbike, the S 1000 R doesn’t appear to have lost much besides an R and some plastic in the transition to hooligan hooner. While the all-conquering RR packs nearly 200 hp and is a torture rack on long rides, the S1000R dials the juice back to “only” 160 ponies but stirs in more torque (83 ft-lb), a tubular handlebar and more comfort for more real-world rideability (and wheelies!). Remember, a Miata makes 167 hp, weighs about 2,000 pounds more and people race the heck out of them. 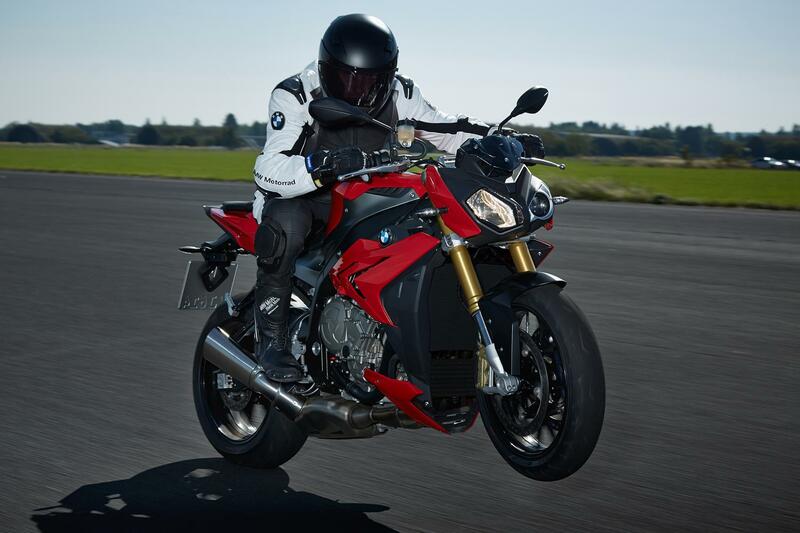 While the S 1000 R may look stripped down (and that’s the general idea), it’s still packing a tech punch with Automatic Stability Control, ABS (including a Race mode) and Traction Control, all of which are rider-adjustable through the LCD display and bar buttons. Electronic suspension control upgrades are available as an option as are myriad other add-ons from a bigger fly screen, that $900 GPS unit, cruise control, soft luggage and more. Yes, you can tour on a S1000R. Quickly. There’s also an optional track-only (wink wink, nudge nudge) exhaust system – thank goodness – since the EPA-mandated plumbing is plain fugly. As always, BMW’s styling choice for the S1000R may put off fans of symmetry, with its continued obsession with odd headlight pairings. As on the RR, the R features a pirate’s face of a cat-eye low beam and a high-beam orb stolen off a slide projector. I’m sure there are very good technical reasons for the ugliness of it. No pricing was announced but as you can imagine, “it was a bargain” won’t likely be a phrase new owners use when meeting up with their riding buddies. Also, BMW is celebrating 90 years of motorbike innovation this year; please pay no attention to the war years behind that curtain.